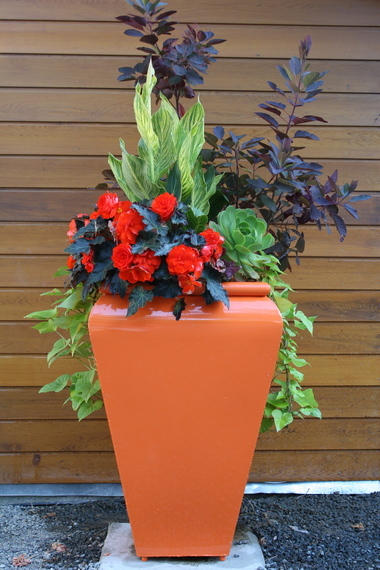 Give your garden a little boost with containers! If attacking an entire garden project seems too overwhelming to you, may I suggest that you forget about it and do a couple of container gardens instead? Instead of dealing with weeds, rocks, beds, pests, diseases and edging you can start with a clean slate. All you need it a pot, some complimentary plants and a tinge of creativity. Once you have a few container gardens established you can change out the plants during seasonal changes, move them around for a different perspective, and even use them for holiday decorating. Another great use is for herb gardens that you can place right by the kitchen, as well as growing one vegetable such as tomatoes or lettuce varieties. Do you want it to be all one color with different textures? Do you want it to have a balance of different heights of plants? Do you want something simple that you can just water and be done with?